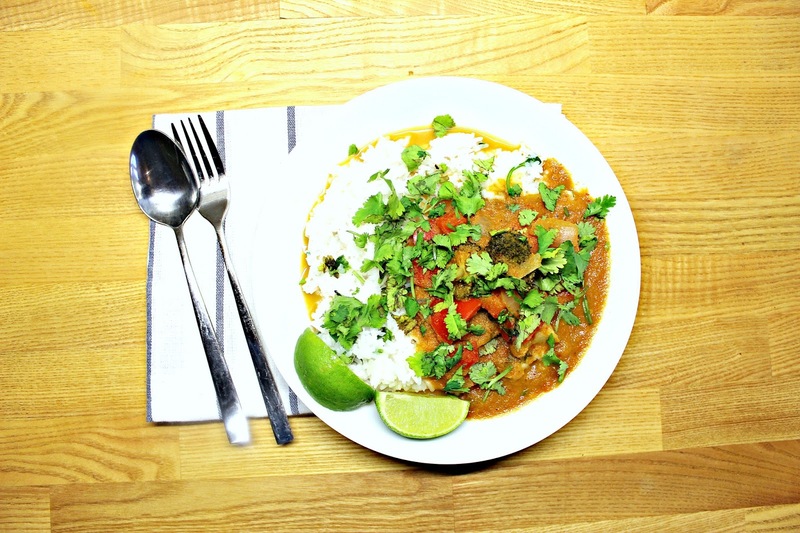 Before I turned plant based, I never even thought of making my own Thai curry paste. I used to buy what ever was available in the market. But that has changed, for good. Even if you are not vegan or vegetarian, try and make your own curry paste once and you won't buy it from the supermarket ever again. It is really quick & easy to make and it tastes amazing and is so much better for you. Blend all the ingredients into a smooth paste. In a pan heat some extra virgin olive oil and then add the remaining half of your chopped onion into the pan. After sweating the chopped onion for a few minutes, pour in your paste. Let it cook for 5 minutes or so and then add all your vegetables. I used carrots, broccoli, cauliflower and the remaining 1/2 of my red pepper. Let the vegetables cook and after 5-7 minutes of cooking add in a cup of coconut milk. Let this cook for 10 minutes and then add another cup. Check for seasoning, add more if you think it needs a bit more. I usually go in with a tiny bit more of salt, pepper & chilli! Your curry should be ready in maximum 40 minutes and this really depends on how crunchy you like your veggies! Serve with steamed rice and lots of coriander and a wedge on lime on the side.